We had the opportunity recently to watch the process of photographing a squeeze. Digital Initiatives has a number of projects under way at any given time, so we were lucky that Chris was able to fit in photography of some squeezes over the summer. He has photographed about 30 – 40 squeezes which we hope will go live on the Digital Initiatives website in early September. The process is fairly simple. 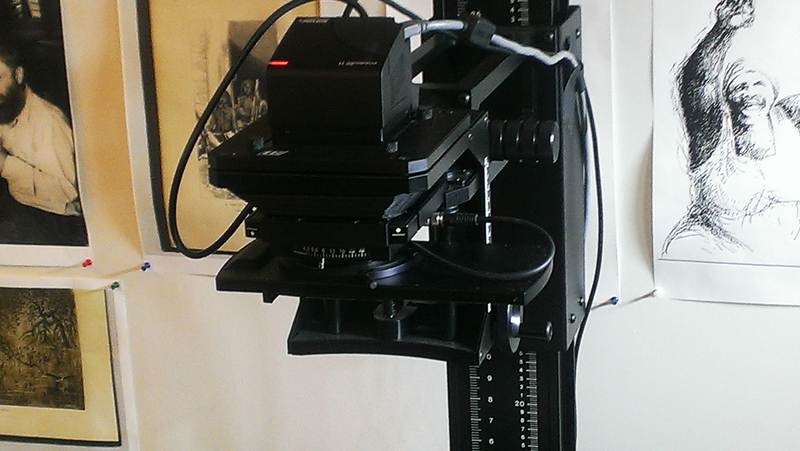 Using a Sinar camera the squeeze is laid on a vacuum table about 6′ by 4′. The vacuum table is useful for their standard projects with 2D images, but because they don’t want to flatten the inscription on the squeeze, it isn’t used for our project. Some of the squeezes are quite large and were folded in the drawers for years, so they have to be spread out and weighted down on the corners to allow the folds to relax so there is no shadow on the print. 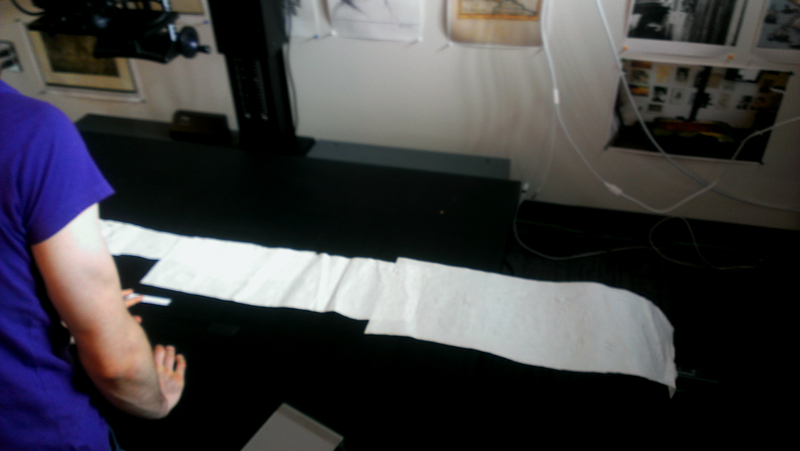 Even this does not always relax the paper enough for a clear photo; the squeeze can be weighted down on the vacuum table and positioned sideways to minimize the shadow in the folds. It is a time-consuming process to lay out all the squeezes, give them time to relax and find the optimum layout so the entire inscription is clear in the photograph. It can take 1.5 – 2 hours to photograph a single inscription; many of them are from fragments of stone so there are multiple squeezes to most of the inscriptions. Once the squeeze is placed on the table, Chris is able to adjust the height and focus of the camera. The camera image is live on a computer screen beside the table so he can see exactly what the photo will look like and make adjustments accordingly. 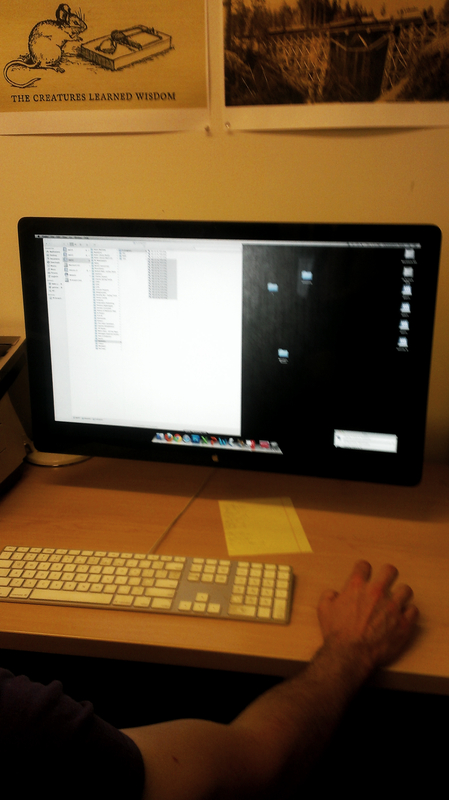 In addition to the squeeze, Chris includes a grey scale gradient and a ruler – both for scale and for ease of identifying whether or not the image has been flipped. Flipping the image is one benefit of having a digital image that can be easily manipulated; in this case it means we can read the inscriptions from left to right instead of attempting to read the Greek script backwards without any word breaks or punctuation. Trained epigraphists are used to reading this way, but for most of us it is a hurdle we are happy to avoid. 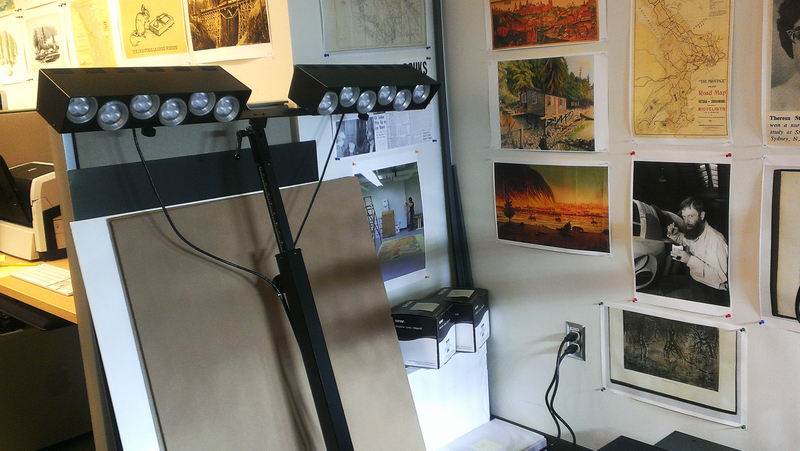 The photography set up has a light array on either side. Generally photos are taken with both light arrays lit, but for the squeezes photos are lit from one side to maximize the shadow on the page. The photos are 6000 x 4000 pixels which allows the viewer to zoom in and examine the text in minute detail. Once Chris is satisfied with the set up he will take 4 photos, each shifted by 1 pixel and with a different exposure. Once those 4 images are opened in Photoshop, as long as there are no major discrepancies between them, they can be merged automatically. Merging multiple images brings out the shadows and makes the inscription clearer. In some cases, especially where a squeeze is too large to be photographed in a single shot, the photos may need to be merged manually. Chris works directly with the RAW files because the wider dynamic range provides a better exposure value. Some adjustments have to be made depending on the state of the squeeze – some papers photograph with a yellow, pink or green tinge, and some are slightly water damaged. At this point, Chris removes the black background of the vacuum table and replaces it with a light neutral grey, so not to distract from the squeeze, and adds a drop shadow so the edges are clear. Once satisfied with the final adjustments, the file is converted to a TIFF file that users will be able to download from the website to be used for research anywhere in the world. TIFF files are smaller and more manageable than RAW files, but still provide an amount of detail which allows very precise study of the inscription. Thanks to our partnership with Digital Initiatives and Chris Pugh’s hard work over the summer, we have about 10% of our collection ready for study. Over the coming school year we will be fundraising and applying for grants to fund the digitization of the rest of the collection.